Dave Stoneback, Evanston's director of utilities, addresses the audience at the Green Drinks talk held at Farmhouse Evanston. 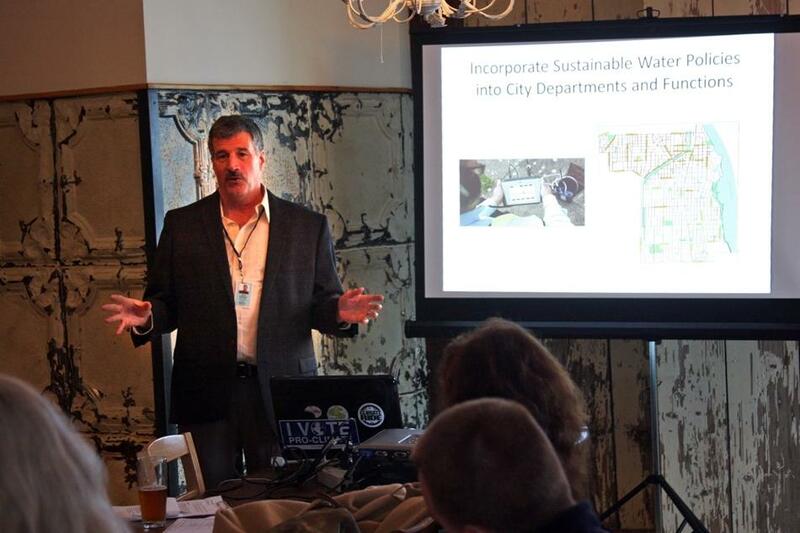 Stoneback updated the audience on the city's water conservation plan. Two speakers gave an update on Evanston’s water conservation plan and the impact of climate change on precipitation levels Wednesday evening as part of Evanston’s recognition of National Drinking Water Week. Dave Stoneback, Evanston’s director of utilities, and Dr. Sarah Lovinger, executive director of Chicago’s Physicians for Social Responsibility, spoke to a small audience at Farmhouse Evanston, 703 Church St. The city and sustainability group Citizens’ Greener Evanston sponsored the talk as part of a monthly Green Drinks series on sustainability organized by CGE and Farmhouse Evanston. “CGE’s main mission is to improve or reduce Evanston’s carbon footprint and make Evanston a more sustainable community,” said Jonathan Nieuwsma, CGE’s vice president. Evanston adopted a water conservation and efficiency plan in 2012, Stoneback said. Stoneback told the audience the city has given out about 7,500 reusable water bottles and has provided 9,000 gallons of water to both city and Northwestern events. Stoneback said Evanston is also using newer technology that detects water main leaks around the city. He added that the city believes it has saved 15 million gallons of water per year with the new technology and measures. Lovinger spoke about how she believes climate change is impacting global precipitation levels. She said the number of days characterized as “excessive precipitation events,” constituted by more than 2.5 inches of rainfall in 24 hours, is increasing. Lovinger said this issue is a global health issue, as floods may contain harmful pathogens. She emphasized Milwaukee’s 1993 pathogen outbreak in drinking water which sickened more than 400,000 people and resulted in more than at least 69 deaths. In the local water conservation effort, Stoneback said Evanston is responsible for creating change. “The city has to be the leader on it,” Stoneback said. Clarification: This story was updated on May 7 at 8:40 p.m. to reflect AP style.